For a totally unique day out in London that combines adrenaline-pumping adventure with breathtaking views, look no further than the Up at The O2 Experience. 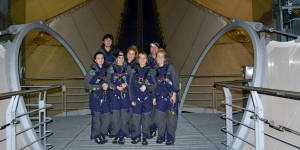 Join a group of explorers for a walk to remember, scaling the 380m walkway across the roof of The O2. The experience begins on arrival at The O2, where participants will get kitted out in climbing suits and gripped shoes, before receiving a safety briefing from the instructor. Then the climb to the summit begins... the walkway is given a bouncy feel to replicate The O2 tent beneath, and is 52m tall at the highest point, providing incredible panoramic views of London all around. The climb can be booked either during the day, at sunset, or at twilight for a range of different cityscapes - from bright sunshine to twinkling stars! The whole walk takes around one hour to complete from start to finish, where you'll end on solid ground on the other side of the arena. The Up at The O2 Climbing Experience makes a fantastic family day out in London, or a unique experience gift for adventurous individuals that will be remembered for a lifetime. Tick off a bucket list item this year and try a London activity like no other! Experiences can be booked throughout the year on selected weekday and weekend dates. Weekday availability is more restricted in January. Late arrivals will not be admitted or refunded. There must be at least one over 18 to every two under 18s taking part. The actual climb lasts around 1 hour, but with the briefing the entire experience lasts 90 minutes. Please arrive 15 minutes prior to the booked time. Participants: The Up at The O2 Climbing Experience is for 1 participant. All safety equipment will be provided by the instructors, including a climbing suit and shoes. The climb will be cancelled in particularly adverse weather conditions, such as lightning, high winds, heavy snow and ice. The experience will be rescheduled for another date if this situation occurs. I really enjoyed the experience, Hannah is a very good guide. Health and safety second to none. My only negative is there should be water at the top it was a very hot day and I was very dry by the time I had climbed up. If you can get champagne up there Im sure bottled water could be offered. Brilliant fun from start to finish! As I was doing a night climb, I opted for the jumpsuit overalls - these were awesome in themselves! My climb guide was full of fun facts and was happy to point out all of the London landmarks. It was great to see the city from a completely different perspective and the photos came out well, even in the dark! I had a great time climbing the O2 and learnt a lot from our engaging and reassuringly non-nonsense guide, Ross. I'd highly recommend the experience to anyone who wants to see the city in another light! Great evening from start to finish. We took part in the private twilight expedition and our tour guide Ross couldn't have made us feel more at ease. The views were fantastic all the way up and at the top. Would highly recommend to anyone with a love on London and adventure! 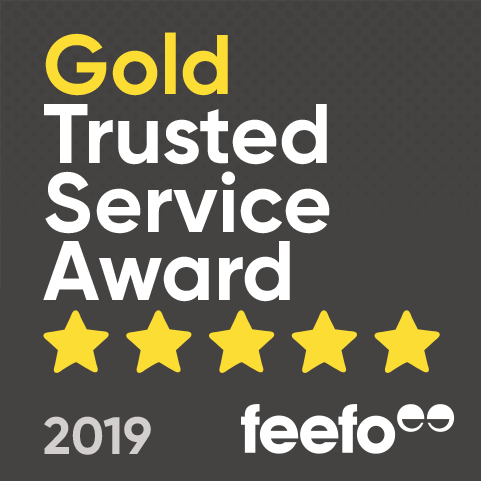 A truly fantastic experience! We did an evening climb, and it was perfect. Seeing London lit up and learning lots of quirky facts. Our Tour guide was super enthusiastic and full of knowledge on London's skyline. Would highly recommend and go again. Well worth a visit. The climb itself wasn't as strenuous as I expected so everyone in our group was easily able to make it to the top. Our guide Ross was great and turned the climb into an enjoyable guided tour of London's skyline. The city skyline views from the top are incredible. The Up at the O2 Experience is definitely worth a visit. 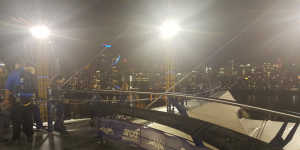 I took part in the twilight climb and it was great to see the night lights of London. Our tour guide Ross was fantastic. This was such a fun way to experience London - it's quite hard work walking up but the views at the top are worth it! Ross was a fantastic instructor, I wasn't expecting a proper tour guide but he was full of facts and stories, making the 'expedition' all the more enjoyable. Definitely recommend! The last time I visited London’s O2 Arena it was the Millennium Dome. I can only vaguely remember an enormous beating heart, an episode of Blackadder and a shiny £5 coin (refused by a shopkeeper some years later). Since the ill-fated Dome’s rebranding, the arena has played host to some of the world’s biggest stars – including Prince, Beyoncé and One Direction – and has become an iconic feature of the London cityscape. The Up at the O2 Experience invites visitors to climb over the landmark via a 380-metre walkway suspended just a few metres from its surface. Upon entering the foyer – decorated with coils of rope, compasses and ice axes – we were handed forms to complete and a safety booklet. After a short wait and a few nervous glances at the furnishings, we were shown through to the Expedition Room. Here, we met our guide for the evening, Ross, and watched a brief – but informative – video, explaining what to expect during the climb. Ross then led the way to the changing room and issued us with boiler suits, rubber-soled shoes and harnesses. Suitably attired and with our possessions stowed securely, Ross lent a rough hand to ensure harnesses were properly fastened, before we made our way to the starting point. Standing at the foot of the walkway, the ascent appeared steeper than I’d anticipated and somewhat exposed without an outer handrail. Ross’ reassuringly no-nonsense demeanour, however, meant I took my first steps full of confidence. Made to replicate the ‘tent’ beneath, the walkway wobbles and bounces underfoot and – though we’d been expecting this – it took some getting used to. Trickier still were the devices securing us to the central safety cable, which had to be cajoled along at regular intervals. Our inexperience was clearly at fault here though, as Ross glided up the slope untroubled. The team were all breathing a little heavier by the time we reached the top. Once unclipped, we were free to wander round the platform and take in the view. The lights of the capital winked all around us and the dark Thames surged below. As we gawped, Ross proved himself a treasure-trove of interesting facts – describing the erratic course of the river and the history of some visible places of interest. By this point, we’d all become rather fond of our guide, whose gruff exterior belied a warm heart and expansive knowledge. Bearded and with “the skin of a Norwegian fisherman”, Ross was a support and pleasure throughout – the Edmund Hillary of urban mountaineers! After a few more photos, it was time to make our descent. The final section was the steepest we’d tackled yet and our steps became tentative as the walkway shuddered beneath us. It was with some relief – plus a real sense of achievement – that we finally set our feet back on solid ground. 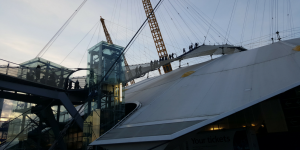 This, my second, visit to the ‘Dome’ turned out just as enjoyable – if surreal – as the first and I’d recommend the Up at the O2 Climbing Experience to Londoners and visitors alike. If you fancy giving it a go, you can find more information and book here. Am I able to propose at the Up At the O2 Climbing Experience? Yes, absolutely you can propose up at The O2 Climbing Experience. If you are planning on doing so, please let us know so we can pass on the details of the exact date and climb you are planning to pop the question! 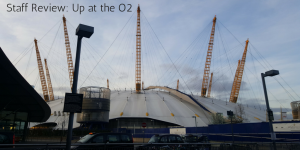 Can I bring my DSLR camera on the Up at the O2 Climbing Experience? Before the climb, you're fitted with a special climbing suit or gilet, each with a small pocket for a phone or compact camera - a DSLR camera would be too large to fit.